This meal pairs well with Red Pepper Corn Relish. Mix turkey, potatoes, catsup, salt, pepper and thyme together. Cover, refrigerate and hold for up to one day in advance. 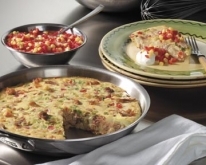 Heat butter and oil in an 8 to 9-inch heavy oven-safe skillet. Add turkey hash and press down with a spatula. Fry for 3 to 4 minutes to brown the bottom. Sprinkle cheese atop the cooked turkey hash. Whisk eggs and cream together for 2-3 minutes until well blended. Add salt, pepper, tomatoes and onions. Pour egg mixture on top of the turkey hash. Bake in a preheated 350 degree F oven for 20 minutes or until the top has just set. Let stand for 10 minutes. Slide onto a service platter and cut into wedges. Serve wedges with sour cream and Red Pepper Corn Relish.